Chief Mark Saunders speaks at a press conference in January, responding to the arrest of four Toronto police officers. Correction: Two of the Toronto police officers charged with perjury and obstruction of justice were identified as working in the Major Crime Task Force. This is incorrect; none of the officers are associated with the Major Crime Task Force. Rather, they worked in the Major Crime Units of their respective divisions. The arrest of four Toronto police officers for obstruction of justice and perjury — after a judge ruled they planted heroin on the console of a suspect’s car to justify a warrantless search — throws into jeopardy past convictions in cases on which the investigators have worked. A team of investigators has also been assembled to re-examine other cases the veteran officers have worked on. The four officers under arrest are all veterans of the force, with 51 years of experience among them. Two of the officers work in their divisions’ Major Crime Units. 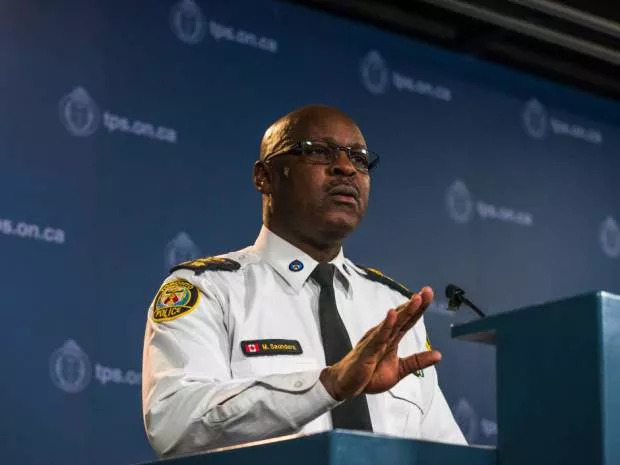 Toronto police Chief Mark Saunders said Thursday four of his officers were arrested and face 17 charges of obstruction of justice and perjury. The charges against the four officers come after a 2014 traffic stop in which police found heroin in Nguyen Son Tran’s car. A judge ruled in September the officers planted heroin on the centre console of Tran’s Toyota Camry to justify stopping and searching the car. The drugs seized in the search were not allowed as evidence in the case and charges against Tran were stayed. The search incident occurred in the city’s eastend Chinatown, around Broadview Avenue and Gerrard Street in January 2014. Police said at the time that they saw Tran run a red light. An officer stopped him in a parking lot, where the suspect, an officer told the court, was trying to hide a white powder that had spilled on the car console. Officers testified that one investigator heard the traffic officer say the licence plate of the stopped car over the radio and it was recognized as belonging to Tran, who had previously been arrested for possessing heroin in the same car. Tran previously pleaded guilty to possession of heroin in that first incident. This time, a police search — justified by the purported dusting of powder — again found heroin behind the steering wheel. More than 11 grams were seized. But Tran told court he was set up. He claimed a plain-clothed officer who had previously arrested him was following him and that he did not run the light. The undercover police were there minutes later and the defendant was arrested. The police radio recordings of the incident played in court backed that claim; nowhere was Tran’s licence plate mentioned. Morgan ruled the officers colluded together and “concocted a false story” to search Tran’s car without a warrant. And even though heroin was found in the car, Morgan ruled, the police misconduct overshadowed the discovery. Who spilled heroin on the console of the defendant’s Toyota Camry? Tran’s lawyer, Kim Schofield, requested the police tapes be kept by the court. She alleged police have been known to formulate testimony consistent with their recordings when it is available at pre-trial. Schofield said the officers “conspired to plant evidence,” and she was glad charges were laid against them. “They figured out afterward that they needed grounds in order to search him,” she said. One of the officers was recently demoted, but Saunders would not say if it was related to the case. The officers have been suspended with pay, a requirement under the Police Services Act. Const. Jeffrey Tout, Det. Const. Fraser Douglas and Det. Const. Benjamin Elliot and Sgt. Michael Taylor are all set to appear in court on March 11. 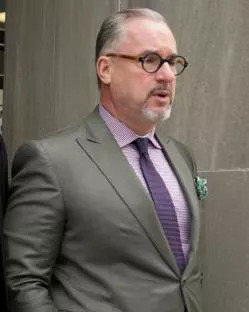 Mike McCormack, President for the Toronto Police Services Association told the public that the allegations against his officers have not been proven yet. Saunders acknowledged the incident diminishes public confidence in police. Toronto Police Association president Mike McCormack voiced concern about the arrest, but reminded the public the allegations are unproven. “This has been a very bad week for the members of the Toronto police service,” he said. Const. James Forcillo was found guilty Monday of attempted murder for the 2013 shooting of Sammy Yatim and another officer was charged Wednesday for firing 15 shots into the engine block of a stopped car during the summer.